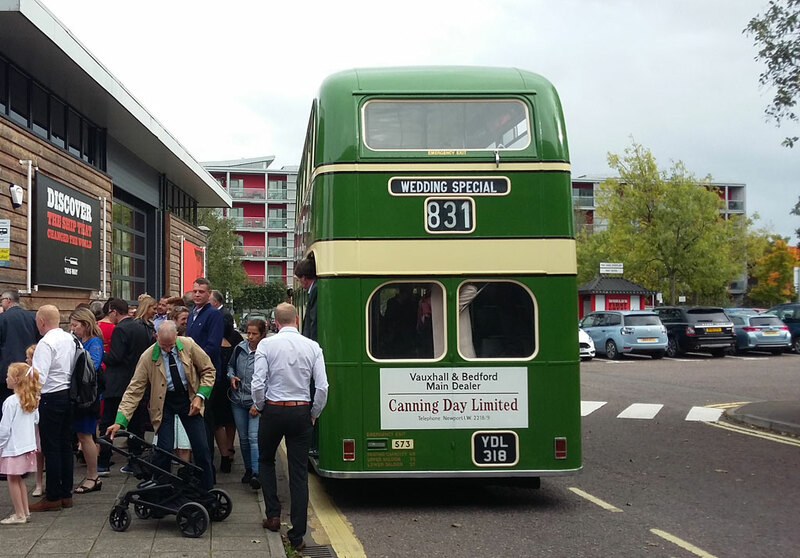 Here’s a rear shot of our freshly repainted Bristol FS6G, Southern Vectis 573 (YDL318). Conductor Kemble and I had the pleasure of taking a wedding party from the Downend area of Bristol to the SS Great Britain and back. 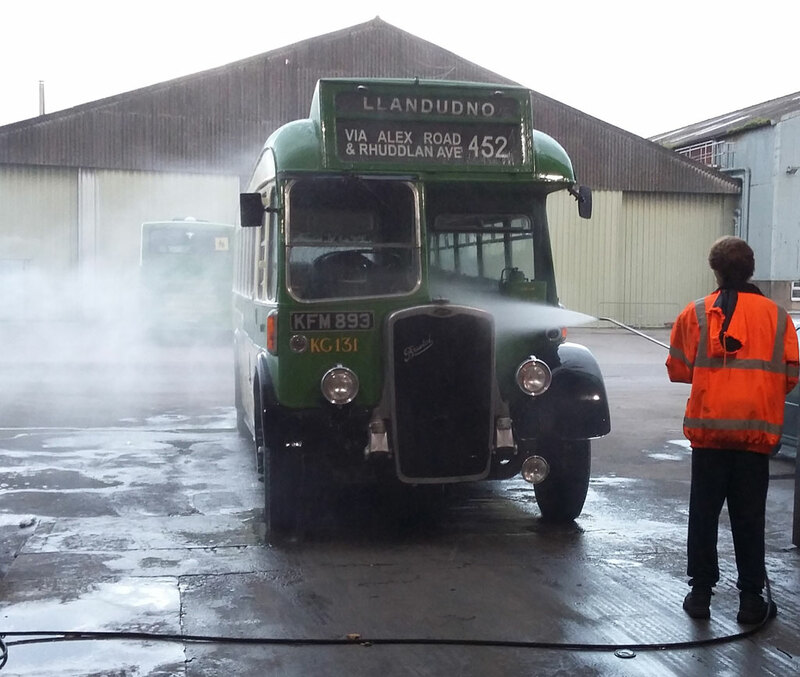 This was the only duty we managed in this bus before it was withdrawn for further mechanical work following an engine rebuild. 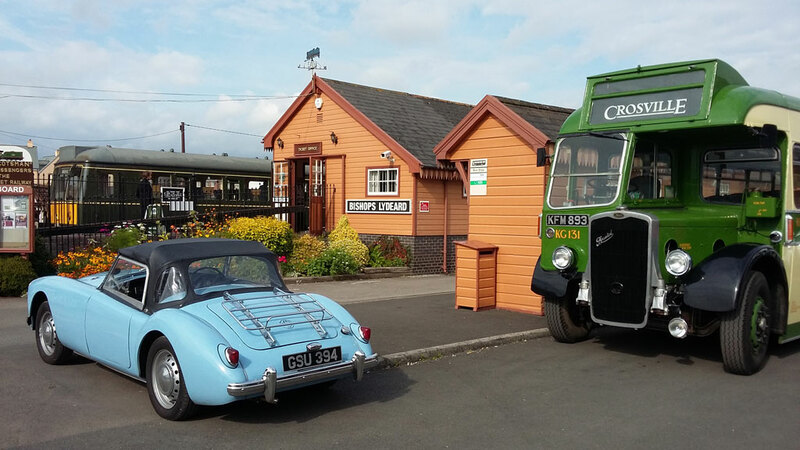 One of the most pleasant outings came my way in late autumn when Conductor Selby and I took a gentleman and his friends and family for a leisurely jaunt around the Chew Valley. The occasion was his 70th birthday and he had secretly arranged the outing without telling any of his family about the mode of transport. The looks we got as we drew up to a bus stop in Nailsea to collect them made me chuckle! Neil (the aforementioned gentleman) and I had carefully planned a route that took in some of Somerset’s double-barrelled villages; Flax Bourton, Barrow Gurney and Chew Stoke to mention just three. The photo shows us at our coffee stop at Chew Valley Lake. Our meanderings then took us through Brockley Combe down to Cleeve where lunch was taken at a very nice Italian restaurant. 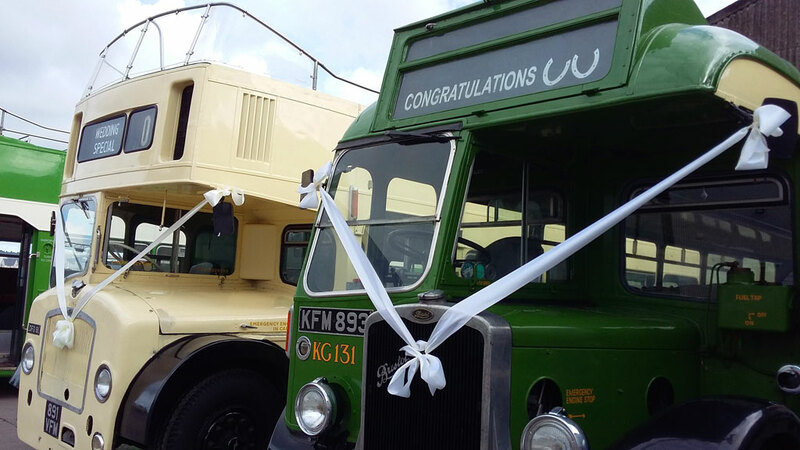 Driver and conductor were invited to partake as well – such a generous man. Thanks Neil! A chilly evening in November saw me waiting with an open top FSF6G for the Weston-super-Mare Carnival procession to begin. 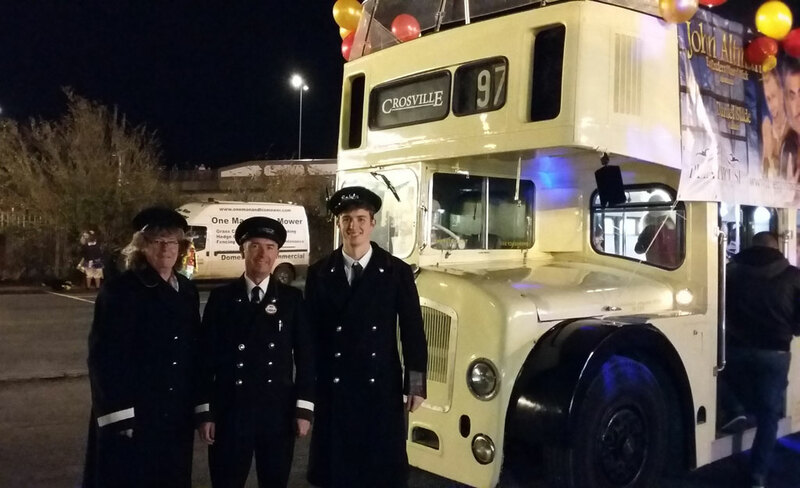 Crosville DFG81 (891VFM) had been decorated earlier in the day by staff from the Weston Playhouse, who had hired the bus to promote the winter panto, ‘Aladdin’. As you can see from the photo, I was joined by Conductor Dawkins (my son Peter) and Inspector Dawkins (Mrs Busman John). She is living proof of the saying ‘if you can’t beat them, join them’! Although it was fascinating to see all the carnival floats (‘carts’, to be accurate) lining up and moving out, we had a rather boring wait to get started. Our position was well down the order and it we didn’t venture out of the coach park until nearly 2 hours later! By then drizzle had set in and the panto cast, who were on the top deck, took it in turns to retreat to the (comparatively) dry lower deck. Conductor and Inspector were busy on the bell too, as Playhouse staff were walking alongside handing out flags and flyers. They also sought refuge from time to time. 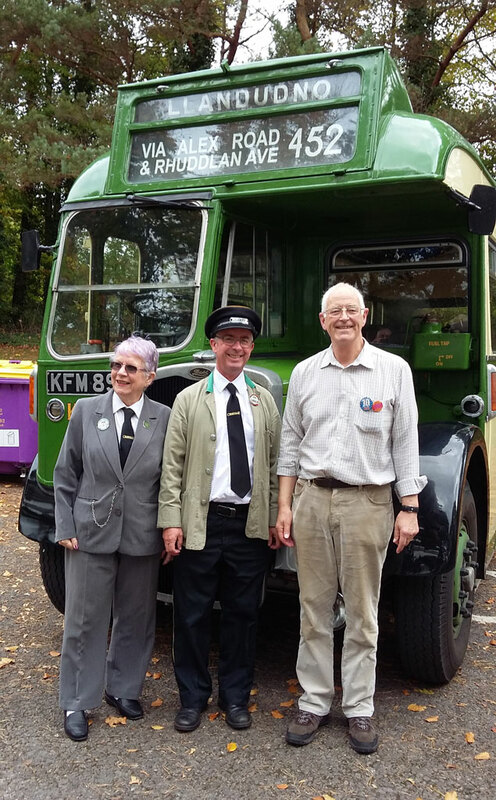 Also taking part in the procession was ‘Elizabeth’, Crosville’s 1931 Sentinel Steam Bus plus a low loader from a sister company carrying our 1938 Bristol L Tower Wagon. Finally, we’ve paid two visits this autumn to Kings Weston House on the west side of Bristol. 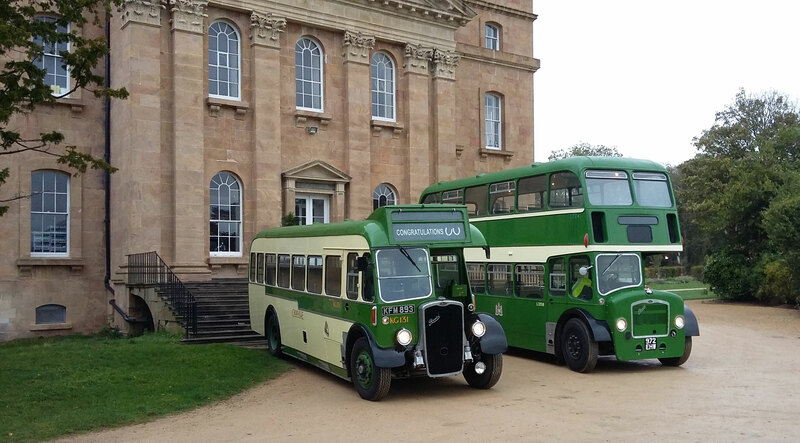 The duty shown involved our single deck Bristol L5G KFM893 and our ex-Bristol Omnibus Company LD6B, 972EHW. This was taken after all the guests had gone into the house for the reception. We had just brought them from the wedding ceremony across the river in Abbots Leigh. A quick blast (if such a thing is possible in such elderly buses) up the motorway led to a more leisurely trundle through parts of Shirehampton to reach the house. My second visit there followed a wedding in Westbury-on-Trym but this was a solo trip for the Lodekka. Earlier, someone with a camera spotted us on layover at the bus terminus in Southmead. And that, dear reader, concludes our autumn roundup. There’s sure to be more in store this year. Keep checking! Happy New Year! This entry was posted in Driving, Private Hire and tagged 891VFM, 972EHW, Bristol FSF6G, Bristol L5G, Bristol LD6B, KFM893, Kings Weston House, SS Great Britain. A Happy New Year to you also John. The L5G outside Kingsweston House brought back a lot of memories. Extremely close to where I lived from 1948 to 1971. A lot of ‘playground’ for a child to explore! Thank you Ray. Nice to know we’ve awakened fond memories of the old home country!